For current Victory Park residents or for those who frequent the American Airlines Center, you’ve undoubtedly noticed a number of changes to the area. Restaurants, bars and retail have started booming in this neighborhood, and there is still much more to come! It’s hard to believe that just 8 years ago, Victory Park was considered a total flop. But it has totally reinvented itself and we’re here to tell you the 15 reasons why it’s time to make the area your new hangout! Celebs like Kim Kardashian and Anna Wintour seek out the magic she works with facial massage, high-tech tools, and custom treatments. But you won’t find Botox or lasers in her studio. The weather in the Dallas area may be cooling off, but the food scene seems to be getting hotter– with new restaurants opening practically every week. One of the most exciting developments has been occurring in Victory Park, where a slate of new dining spots are setting up shop, including Billy Can Can, a modern, steak-slinging saloon– and Imoto, an upscale Pan-Asian restaurant and cocktail lounge. Things are popping in Bishops Arts too. New arrivals include Macellaio, an industrial-chic restaurant devoted to salumi and charcuterie–and Taco Y Vino, an intimate wine bar and taqueria set up in a 1920’s Craftsman bungalow. Adding to the lineup of stellar restaurants in Deep Ellum is Izkina, a cozy tapas and cocktail joint tucked inside of a hip, new hostel. And then there’s Ruins, an indoor-outdoor eatery featuring Oaxacan and South American fare along with a phenomenal selection of mezcal. That’s just a sampling of what’s on the plate this season. Read on to find out which new eating establishments you should be trying this fall. couple, Kent and Tracy Rathbun and features a menu packed with shareables as well as a traditional sushi bar headed up by Nobu alum, Jimmy Duke. Expect to find dishes ranging from honey-soy glazed Korean fried chicken and grilled lamb curry claypots to tempura lobster shooters with kaffir red curry–a fan favorite from Chef Rathbun’s former restaurant, Abacus. Pair everything up with a contemporary cocktail or a selection from the global wine list. Also keep an eye out for weekend DJs and daily specials. Cementing Victory Park as Dallas’ coolest new dining destination is Billy Can Can, a handsome, wood and taxidermy adorned eatery modeled after a late-19th-century saloon. The restaurant comes by way of Tristan Simon (the same guy who transformed Henderson Avenue into a dining hotspot) and offers a menu highlighting modern Texas cuisine. We’re talking everything from Texas venison tartare and fried redfish po’boys to red brick chicken mole, skate wing schnitzel and steaks galore. Drink-wise, there’s a stellar lineup of handcrafted cocktails as well as wine, beer and house-made sarsaparilla. Not to be missed are the churros with warm chocolate mole and lime curd. DALLAS—Victory Park, the 75-acre mixed-use development in downtown, is in the midst of a district redevelopment led by retail partner Trademark Property Co. and owner Estein USA. Victory is undergoing a full remerchandising, adding 85,000 square feet of new retail space and making key enhancements to evolve into a more walkable urban neighborhood. Victory Park surrounds the American Airlines Center, home of the Dallas Mavericks and Stars. The park currently features more than 220,000 square feet of retail, restaurant and entertainment space; 621,000 square feet of class-A office space, the 252-room W Dallas–Victory Hotel, more than 3,300 residential units and the Perot Museum of Nature and Science. Victory Station provides access to DART Light Rail and the Trinity Railway Express. The 3.5-mile jogging and bicycle path, The Katy Trail, is also directly accessible. This year, Victory Park is opening more than 10 food and beverage concepts and has welcomed Cinépolis Luxury Cinemas-Victory Park and WeWork, along with new public art. Orangetheory Fitness Victory Park is also a new tenant, located at 625 High Market St. Victory Park’s tenant list continues to expand with the addition of Jinya Ramen Bar, known for its ramen and Japanese-inspired cuisine, new bakery concept Sift + Pour and Biagio Wine & Spirts, all of which are new to the Dallas market. The menu offerings at the rebounding Victory Park will expand over the next few months with ramen, sweets and booze. Jinya Ramen Bar will serve more than 10 signature ramen recipes with 20-plus toppings. The menu also will include rice and curry bowls and a variety of Japanese-inspired small plates. Jinya Ramen Bar’s 3,000-square-foot location, a first for the brand in North Texas, will debut this winter at 625 High Market Road. Hours of operation will be 11 a.m. to 12 a.m. Sunday through Thursday and 11 a.m. to 2 a.m. Friday and Saturday. The brand’s website lists eight locations in Texas, including four in Houston. Sift + Pour Bakery will feature mini cupcakes, cake pops, brownies, macarons, and made-to-order sweet or savory crepes. The concept also has a full espresso and tea bar and serves wine and beer. Sift + Pour will open its debut location late this year at 2401 Victory Park Lane. Biagio Wine & Spirits will offer wine and liquor beginning this fall. Its 2,600-square-foot location at 2404 Victory Lane will operate Monday through Saturday from 10 a.m. to 9 p.m. Victory Park, adjacent to the American Airlines Center in Uptown, is seeing a rebirth with the opening of restaurants and entertainment options designed to boost traffic in the urban entertainment district that took a hit during and after the recession. More concepts opening this year include the flagship location for the Mesero brand, wine bar Burgundy Swine and a restaurant by This & That Concepts (the team behind High Fives and The Standard Pour). Also on tap is a bar by Brooke Humphries (also known for Barcadia, Beauty Bar, and Pints & Quarts); frozen treats from Popbar; a 24,000-square-foot restaurant and entertainment concept in Victory Plaza by Humphries and Elias Pope’s 8020 Hospitality (the team behind HG Sply Co.); and a creative workspace with a day-focused café by Rebees. Co-working firm WeWork — already the biggest shared office space provider in North Texas — is growing its footprint with a new location in Victory Park. The New York-based firm has rented two full floors of offices in the Victory Plaza building at 3090 Olive Street — at the entry to American Airlines Center. The new facility will include everything from private office suites to communal workspaces. The 52,000-square-foot Victory Park co-working center opens early next year and will join WeWork’s Dallas-area locations on McKinney Avenue in Uptown, in Thanksgiving Tower in downtown and in Plano’s Legacy business park. Founded in 2010, WeWork provides office workspaces through more than 100 locations worldwide. WeWork expanded to the Dallas area in 2016. 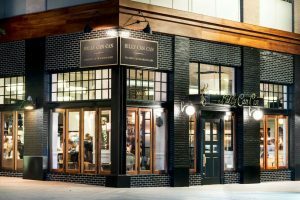 Billy Can Can, a new bar and restaurant from restaurateur Tristan Simon, has finally announced plans to open in Victory Park. The self-described-”saloon,” in the works since early 2017, is set to arrive at the end of June at 2386 Victory Park Lane, according to GuideLive. It’s the first of many planned new eateries for Victory Park, which has struggled for years to attract diners to the neighborhood, and hopes to revitalize an area that never really took off. It will be interesting to see how the food shakes out at Simon’s first eatery under the Rebees umbrella, especially considering that Dallas Morning News restaurant critic Leslie Brenner has been involved with the project since leaving the paper in 2017. As far as the food is concerned, Chef Matt Ford will helm the kitchen and serve a menu of Southern fare mostly inspired by Texas. Look forward to familiar plates like Gulf snapper, venison tartare, and deviled eggs, all exhaustively tasted by Brenner before hitting the menu. As with any saloon, Billy Can Can will have plenty of cocktails, including drinks inspired by Victor Tangos, the now-shuttered Henderson Avenue restaurant founded by Simon. Billy Can Can makes its Dallas debut on June 28. “This is definitely the next chapter,” says chef Kent Rathbun inside his new Dallas restaurant Imoto a week before it opened. The well-known Dallas chef has worked in restaurants all over Dallas and its suburbs, most notably at Abacus, the Uptown Dallas restaurant with which he’s no longer affiliated. “This is a longtime dream for me to have a restaurant like this,” Kent says. The Rathbuns eat Asian food more than any other cuisine, they say, and both have traveled to Asia. Fans of Shinsei might find a few similarities with Imoto, but the Rathbuns are quick to correct that this isn’t a copy of another restaurant. Imoto opens Friday, June 15, in a neighborhood the Rathbuns think is an interesting new option for Dallas diners. Culinary power couple Kent and Tracy Rathbun have some exciting news for Dallas diners. The duo is set to open Imōto, a new Pan-Asian restaurant and bar, in Victory Park on June 7. The project marks Kent’s return to the Dallas restaurant scene after leaving his beloved restaurant Abacus in 2016, and becoming involved in a legal battle with his former business partners. Meanwhile, Tracy has kept busy opening Lovers Seafood Market and preparing to expand Shinsei with a second location at DFW Airport.